Their lookbook game…so on point. Now, who wants to plan a trip to Venice for Carnival? ahhh I was in venice for carnaval last year it was AMAZING. bought myself two masks 🙂 free people is always on pointtt ! There are some really interesting pieces here. I am liking the black and white photos! wow so marie antoinette! love it! wow so marie antoinette love this shots!! ohh i want to! these photos are gorgeous. the masks are so fascinating. 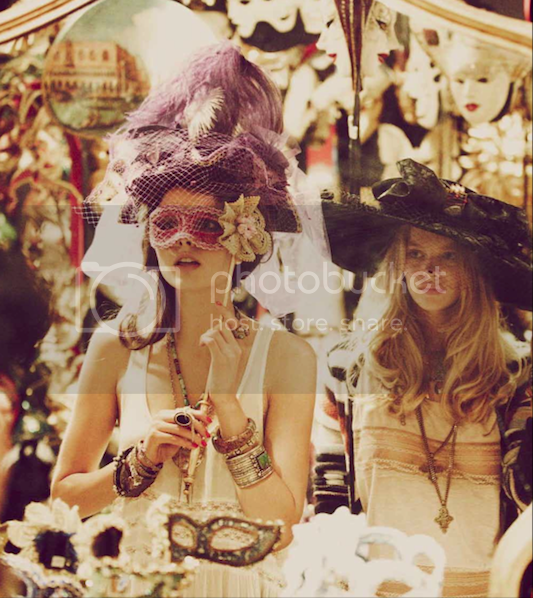 *Gasp* Free People do it again and again and again and…..Always beautiful clothes, accessories and photography. Oh my! I want to be there!!! The masks and nostalgia of the shots are beautiful..
the first one is spectacular!! your blog has the best content, love it. I love a good masquerade. The mystery and the drama. The masks are beautiful. I love the photos.. such a vintage feel… the bracelets are fantastic!